Beautiful flowers! 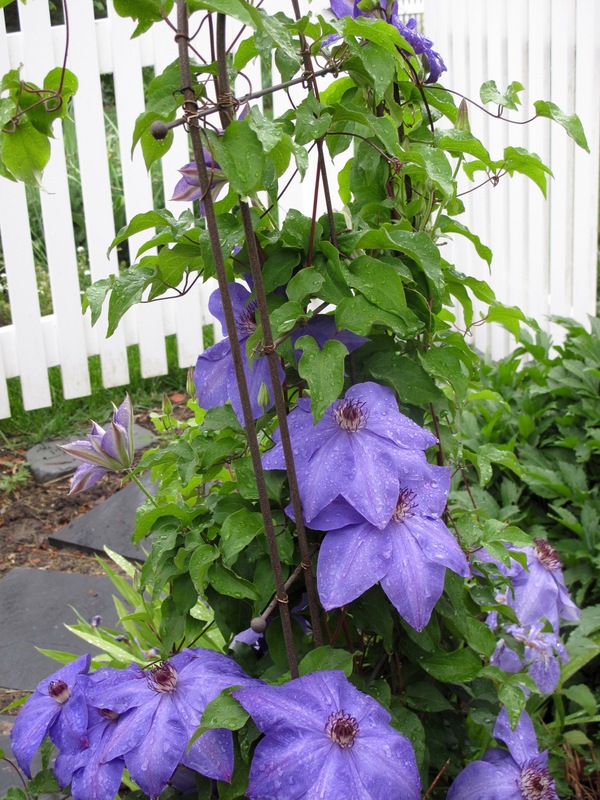 I’ve always wanted to grow Clematis ‘Jackmanii’. I have trouble growing it in my yard, whenever I get a new plant something eats the roots! Drives me crazy. I’m searching for a way to outsmart them. Hoping to grow them in containers this summer! Thanks Angie. Hope the container solves the problem. They seem to take several years to become established. Voles are a big problem in my garden so I share your frustration. But we gardeners have to keep trying. Thanks for “scampering out there…the raindrops are equisite adornments. Thank you Ricki. I agree about the raindrops. There had seemed to be a break in the rain so thought I had time for a few pictures before it started up again, but it actually was still drizzling. But I really wanted to check out the new flowers. I love the color of ‘Niobe’! Beautiful picture of the iris too. Thanks Sweetbay! Yes, the color is nice. Really hoping Niobe blooms all summer as promised. Thank you. Such a wonderful time of year when everything is fresh. Thanks Dom. The earliest Jackmanii has bloomed here was March 30, 2012 (very warm spring indeed). Mid-April is normal for it here in Chapel Hill. It looks like we are experiencing the same blooms right now. I do love that Immortality. Someone passed that iris to me years ago. Little did I know how wonderful it would be. 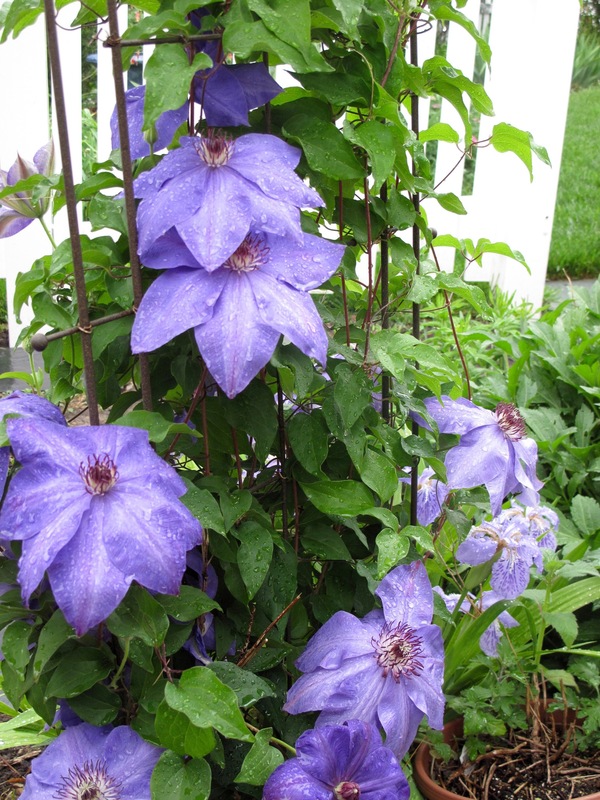 Your clematis are beautiful. They do not enjoy the climate where I live, but I have been nursing one along in a pot. Thank you. 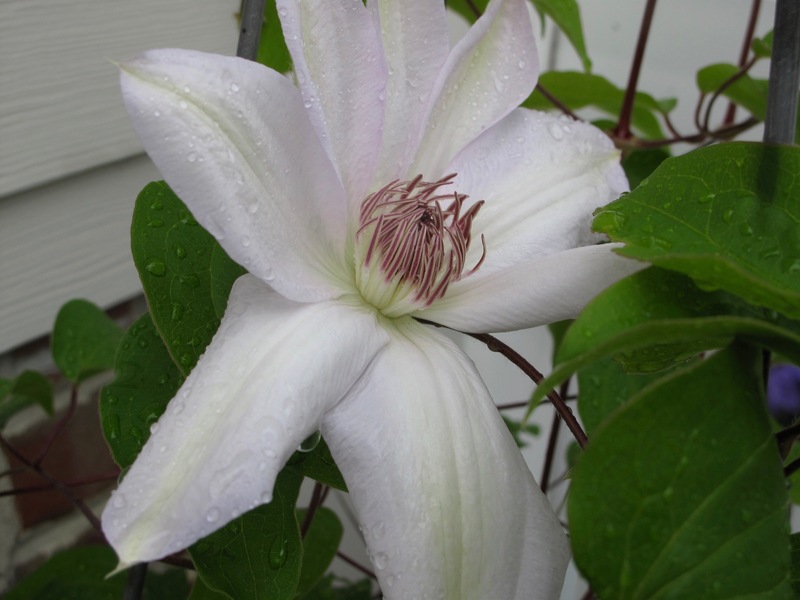 I checked out your blog and saw the clematis. It seems very content. 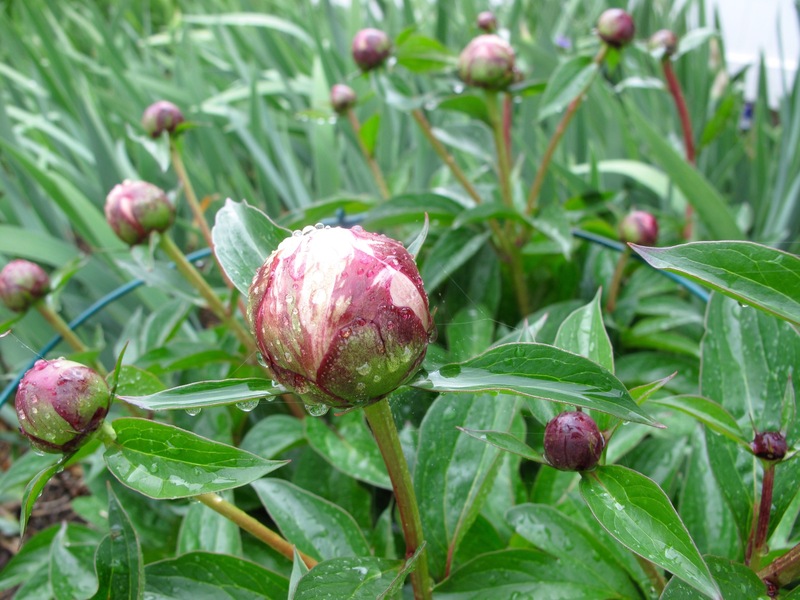 Look at those peony buds, and I see staking in place as well, so promising! You’ve inspired me to rescue my clematis plants and try and give them a spot more to their liking. Those blooms are amazing. I’m anxious to see those peonies open. Good luck with your clematis. Hope you can find them a happy location. I’ve lost several in past years but finally these seem to be willing to try. 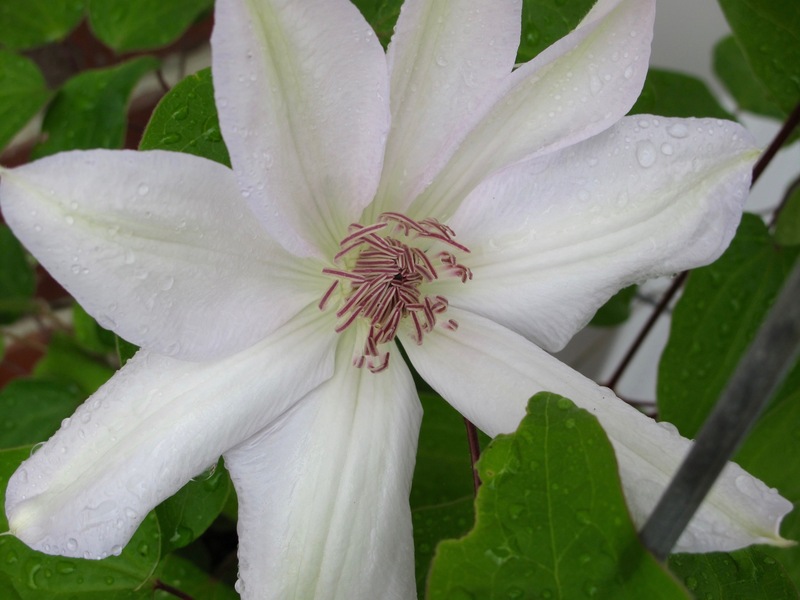 Clematis ‘Niobe’ is really beautiful. 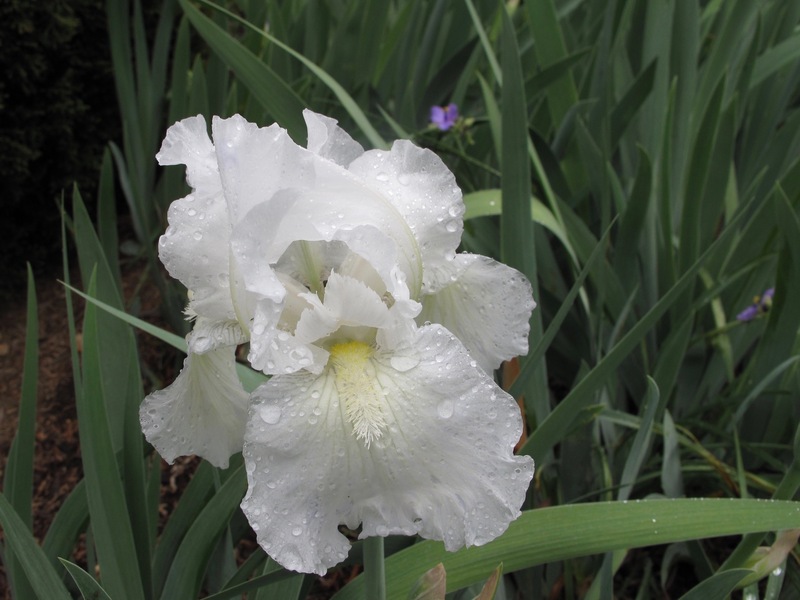 And what an inspired combination with the white iris. Lovely job! Thanks. 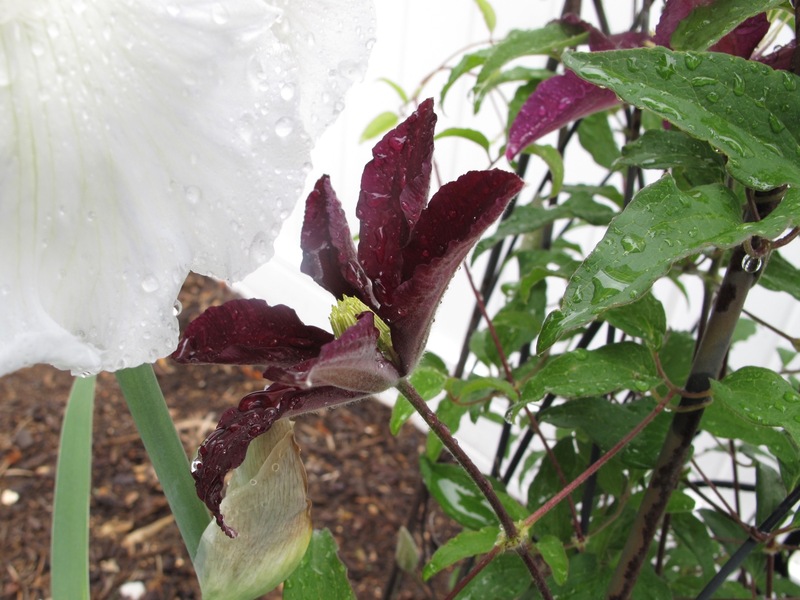 Must admit the pairing of Clematis ‘Niobe’ with the white iris is as much happenstance as anything. They do work well together. Your clematis are beautiful, how nice to have them flowering so early, we have to wait a bit before our large flowered ones start flowering. I’m interested in your Iris tectorum, sounds as if it might like one of my shady borders! Thanks Pauline. 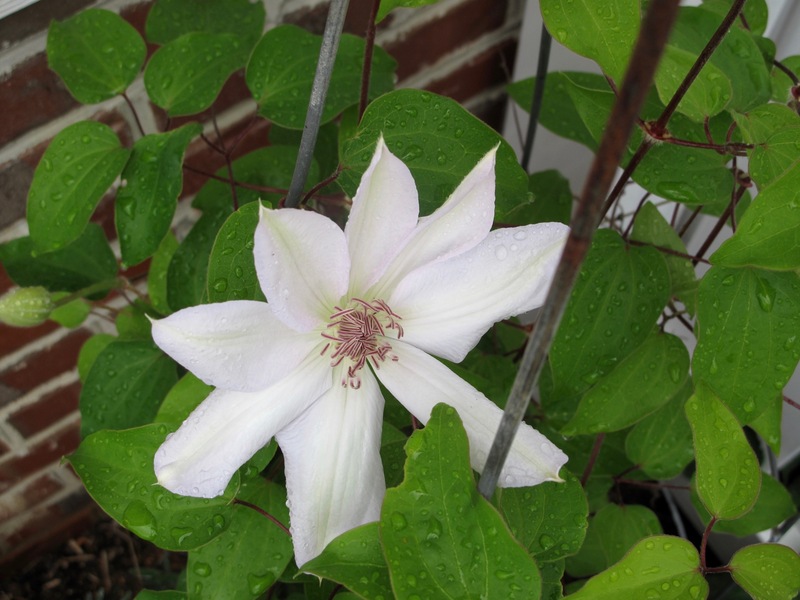 This is the typical time for these clematis here. I think you would like Iris tectorum. 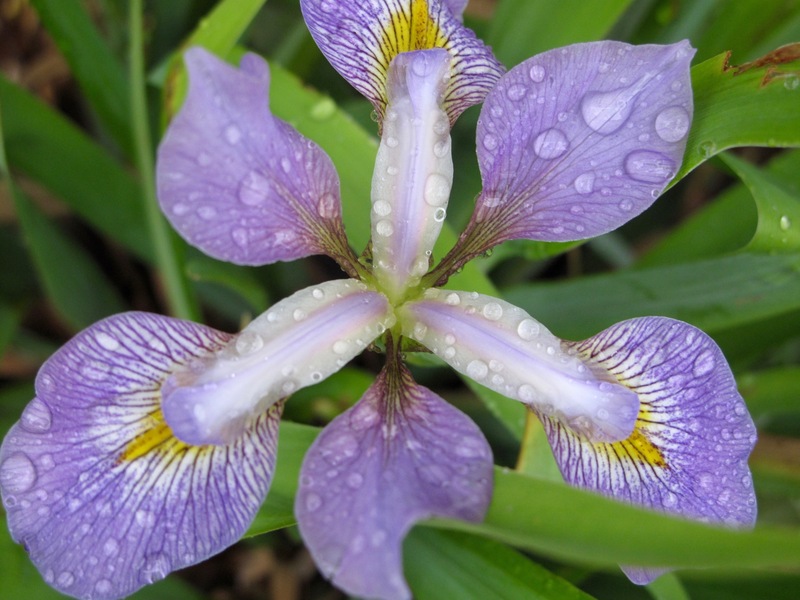 I saw 3 people in my neighborhood today at a community yard sale who mentioned the iris I gave them is in bloom and of course it was Iris tectorum. Some are in sun but others are under the Carolina Sapphire I showed in my foliage post. Gorgeous. 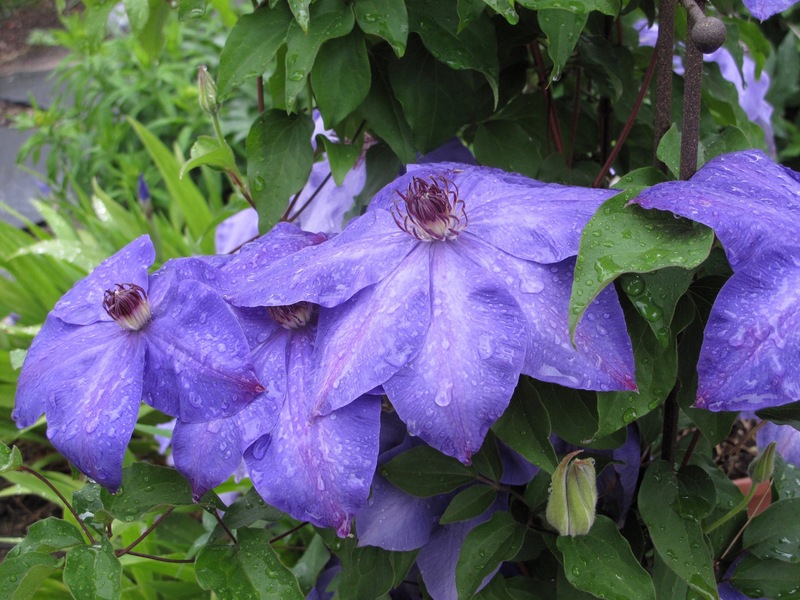 Your Jackmanii looks more blue and less purple than mine, with wider petals. Your Jackmanii is the king of all things Jackmanii. This one doesn’t get nearly as large. You have a gorgeous collection of Clematises! I have two ‘Nelly Moser’ vines at the corners of the house, and they seem to love it there–facing south. They’re just about to bloom. Mine seem fuller at the bottom this year, too. All your flowers are amazing! You seem to be about two to three weeks ahead of me now. Enjoy your lovely blooms! Thanks Beth. Will have to look for ‘Nelly Moser’. Interesting yours is fuller at the bottom too. It’s turning very hot this week. Hope the garden can hang on. Clematis make wonderful contribution to the garden. The white iris is beautiful. 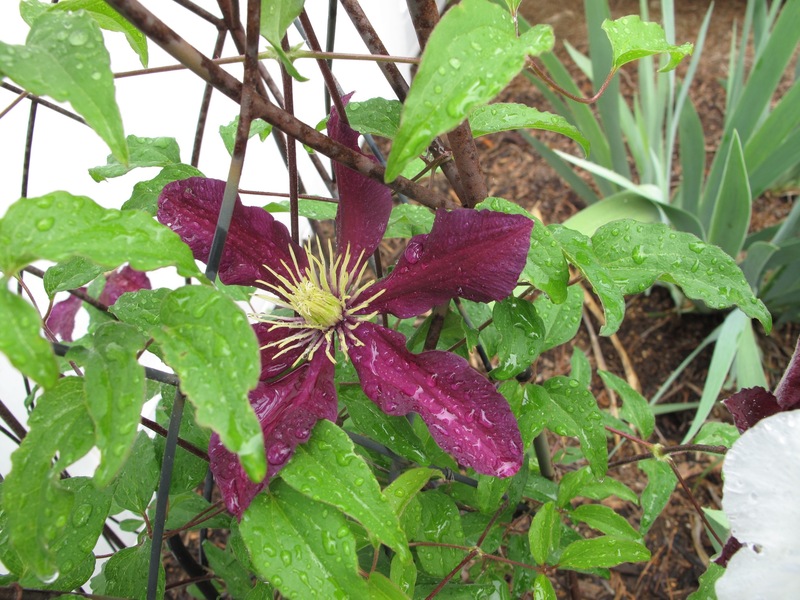 Very beautiful Clematis, especially the Niobe. 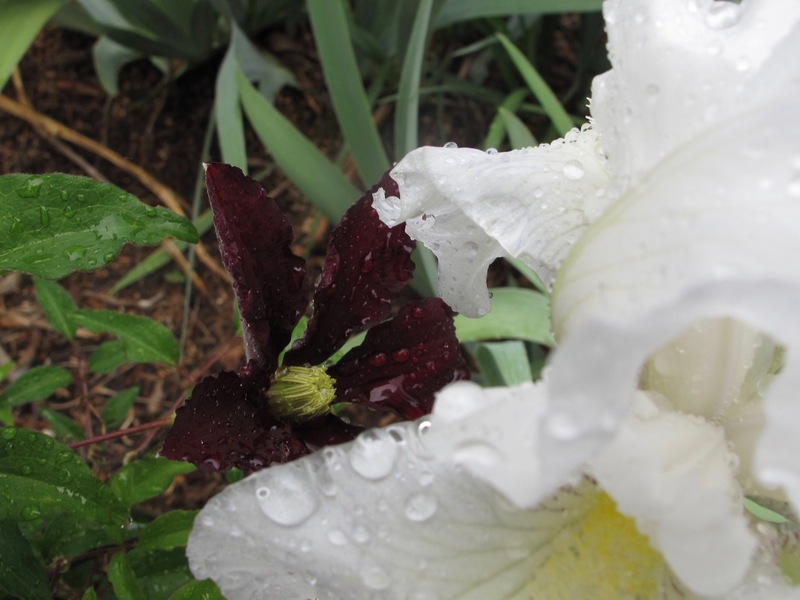 A beautiful deep red with white iris in the background makes it’s beauty even more pronounced. So excited C. Niobe survived last year’s heat and returned with these pretty blooms. Glad the flowers spoke to you Judy. Flower power is real. My goodness you are at least a month to 6 weeks ahead of me and with the cold April it will take a while to catch up. But oh those clematis. Mine are getting some new leaves just starting. I pruned mine when we had a warm up in March as they began growing then. But the leaf buds stayed tight until now. Wow, that is a big difference. Your garden will explode with color when the weather warms.